All transactions are safe and secure with a reliable history in online purchasing behind each of our associates. 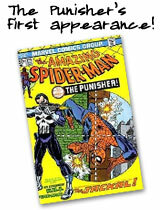 Buy the Amazing Spider-Man #129 Punisher First Appearance Comic Book to own Punisher clothing and merchandise. Own the 1974 comic book that introduced the world to The Punisher character. His first appearance in the Spider-Man comic is perhaps the most important character introduction from the Bronze Age of comics. Since his initial encounter with the web slinger, fans have embraced the character as well as the comics and movies that followed. Get your hands on this highly collectible issue. In addition to the Amazing Spider-Man #129 Punisher First Appearance Comic Book above, browse the Punisher Clothing Gallery for more apparel like men's and women's clothes, kids shirts or hoodies.